The report generation feature of the Addmen OMR software is quite versatile as it can create different types of reports. Graphical performance report is one of the forms. Moreover, several variations can be seen in the graphical reports too. For instance, you can get a graphical representation of the positive and negative marks scored in the exam, for every subject and also for each topic. Three reports have been presented here that shows positive and negative scores of every test, subject and topic. Overall test scores: The below given report sample provides positive and negative marks of the entire exam, which includes three subjects: Physics, Chemistry and Maths. The first section of the report card has section-wise distribution of the positive and negative scores of the student. The scores are marked in percentage format. This is followed by bar diagrams. 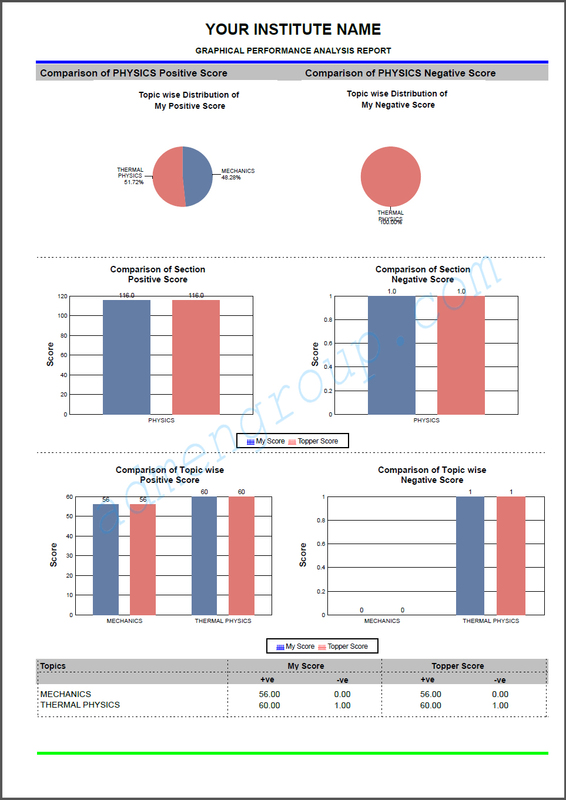 The first bar diagram compares the total positive score of the student with the top five scores and the second bar diagram compares the negative scores earned by the student. 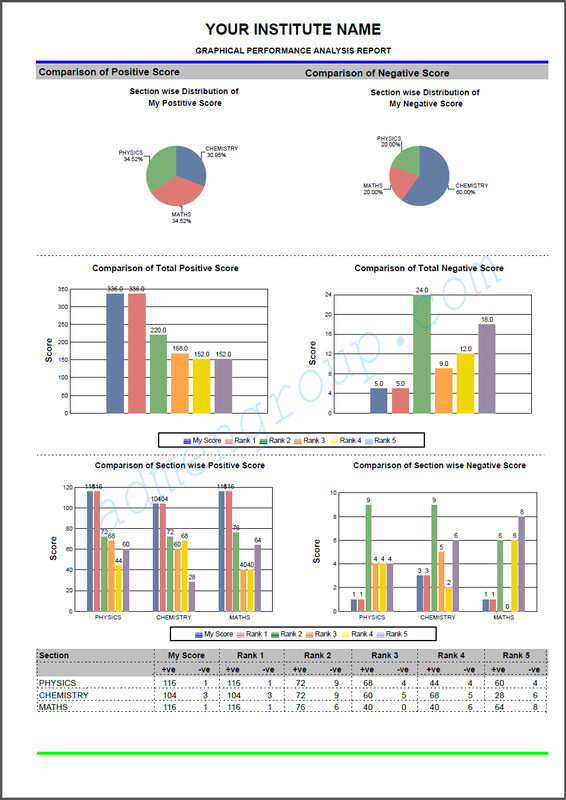 The last section is again a bar diagram which provides the positive and negative marks of every subject and compares them with the positive and negative marks of the five top scores. A table providing the positive and negative marks earned by the student and the top five scorers is also provided at the end of the report. Subject-wise test scores: The three graphical representation reports given below are arranged subject-wise. The first report presents a graphical report of the positive and negative marks that the student scored in Physics exam. This is followed by reports of Chemistry and Maths. Although the marks achieved in all the three subjects are different, the three reports follow the same pattern or layout. The Physics exam has two chapters, the Chemistry section has three chapters and the Maths exam has two chapters. In the first section, the positive and negative marks in each chapter are shown in the form of pie diagrams. Different colors have been used to represent each subject. In the next section, the total positive and negative scores are represented in pie diagram format. The marks acquired by the student in the particular subject are compared with the top score. The last section compares the positive and negative marks in each chapter with the negative and positive marks of the top scorer. These marks are also provided in the tabular format at the end of the report card.